Do the work while the machine is running! Burnishing tools are a preventative maintenance tool used for removing high resistance film on commutators. 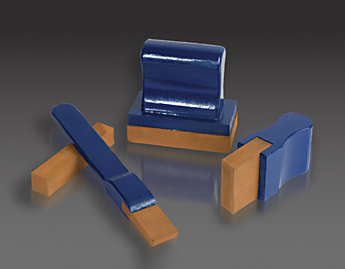 These tools will not cut the commutator and are supplied in a variety of styles. NON-CONDUCTIVE: Made of non-conductive materials, this tool can be used safely on a live machine. LOW IN COST: An inexpensive tool for maintenance of valuable equipment. PREVENTATIVE MAINTENANCE: Is the watchword today. You cannot operate today's motor with yesterday's methods and stay in business tomorrow. Uninterrupted motor operation is a necessity. PROVEN MERIT: Repeat orders from nationally known concerns are proof of merit. These concerns represents a broad scope of industrial activity such as Steel, Mining, Oil, Aircraft, Automative, Chemical, Marine, Public Utilities, Government Agencies, etc. GUARANTEE: Sold under absolute guarantee of satisfaction. These burnishers will hone the commutators to a degree impossible with the finest type of cutting tool. Then will keep it that way with periodical applications at the discretion of the operator. Styles for all sizes of commutators and rings ranging from fractional to heavy duty horsepower are available. Merely hold the burnisher firmly against the commutator until the film or glaze is removed. There is no dusting neither will the slots fill up. Due to its resilient qualities, it will in many cases pull out material already deposited in slots. To accomplish this apply a little more pressure. This Burnisher is not to be confused with a commutator stone. There is no cutting action. It will not reduce mica, flat or burned spots. The burnisher polishes to a perfect face removing only the surface film. Occasionally a slight trace of copper is picked up but this is negligible. If this occurs merely wipe off with a cloth and continue. Observe a commutator with a magnifying glass after it has been finished with a fine cutting burnishing tool. That fussy shredded texture gives way to a glass-smoth polished surface. With a clean, smooth commutator brushes perform better with less noise, contact drop is more uniformly distributed and sparking is reduced. With intimate contact as a result of removing the high resistance film, you can expect better commutation, thereby reducing uneven brush wear and brush failures. Obviously, the efficiency of your machine is stepped up. The preservation of the proper relation between brushes which ride a revolving commutator and the commutator itself is very definitely governed by the condition of the commutator or ring faces. It naturally follows that such important factors as input and output and materially affected. Please call us at 800–310–5999 or complete the form below for a quote.